Director: Paul Thomas Anderson. Cast: Daniel Day-Lewis, Paul Dano, Dillon Freasier, Ciarán Hinds, Kevin J. O'Connor, David Warshofsky, Colton Woodward, Sydney McCallister, Russell Harvard, Colleen Foy. 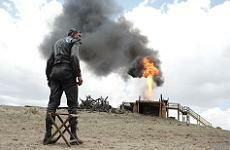 Screenplay: Paul Thomas Anderson (based on the novel Oil! by Upton Sinclair).